Democracy – What is that anyway? Posted on February 25, 2015 by Paul N.
I know, many people would be up in arms when reading this headline. For them democracy is so precious, even bears a state holiness, that they feel provoked, even personally offended, by simply question its usefulness. But those are people deeply imbued by governmental ideology. Any ideology hampers scientific analysis. (The most prominent example is the denial of the helocentric system by the catholic ideology for centuries.) Scientific endeavor has to free itself from any ideology—as far as possible—including its fervent proponents, so I don’t care. It finally convincingly illustrates why a democratically elected government is constitutionally bound to increase the income gap. Despite all rhetoric to the contrary and despite of all the gullible people with good intentions who want to improve government to close the gap. There is another misconception about democracy. Ideology states that democracy constitutes a collective decision and is therefore always the best one. (Condorcet developed a theorem that supports). Mato Nagel recently showed that this is not the case. On the contrary, given the Dunning-Kruger effect, the results of such a collective decision is rather mediocre at best. Now, he is confronted with a lot of hatred for his paper. From an evolutionary point of view democracy is just camouflaged parasitism. Parasites use to evolve camouflage to evade a host’s defense system. That’s the same with a people (host) and the pack of thieves (parasites) who use government (camouflage/evading system) to protect themselves from the people’s defense. Figure 1. 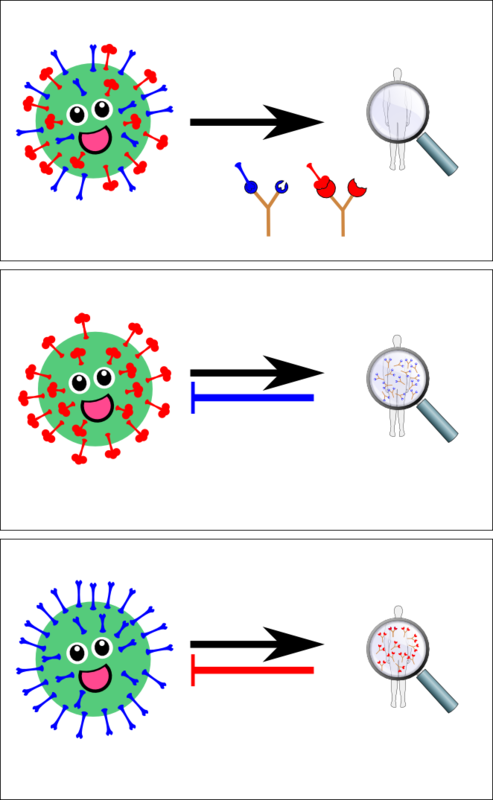 The upper panel shows a flu virus that can invade an individual that has no antibodies neither against the blue nor the red antigen, shown in the lower part of this panel. The panel in the middle illustrated a body that effectively developed blue antibodies. That body can be infected by viruses coated with red antigens only. The lower panel shows the opposite case. In all cases the virus adapts to the immune system to improve its chances to cause an epidemic infection. Even the mechanisms to break a host’s defense are similar to the flu virus. Every year a flu virus generates new strains and by invading the people the one that experiences the least counter attacks by the human bodies becomes epidemic. Every year an other strain. And after a couple of years, when the immune system’s memory has declined enough, an old strain can become epidemic again. Figure 2. The adaptation of social parasites works similarly. Instead of coating antigens, they hide themselves by the shield of government from their hosts defense system. The upper panel shows a population that is not yet immune against any kind of social theft, so their defense systems symbolized by fists in the lower panel are not activated yet. 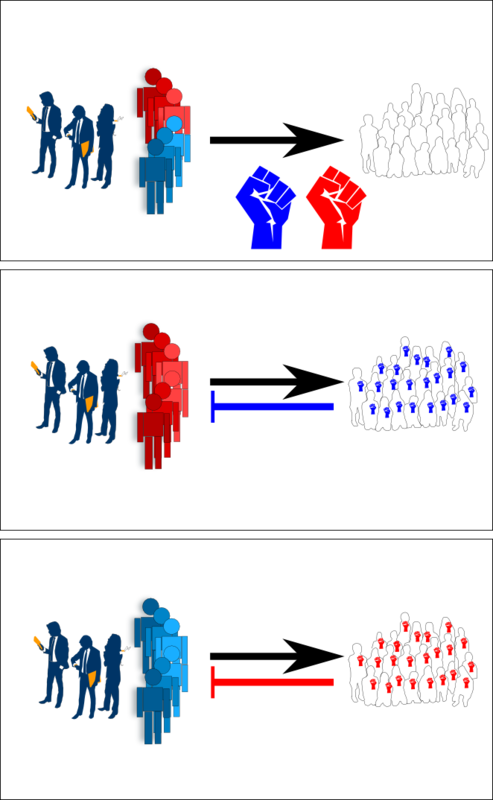 The middle and the lower panel illustate how the shield changes according the accumulation of hatred in the population. Same as with flu viruses, the shield that shows the least counter attack is employed to cause the epidemic. That sound quite similar to democratic elections, and the US American elections in particular. In primaries the most sympathetic candidate is forged and finally chosen to become epidemic for 4-8 years. After that period the people become resistant to that strain (party) and usually elect the other strain (party). Against flu, vaccination is effective. There does not exist vaccination against government. Most people aren’t even aware of its role. It can be depressing to realize that we all live in a state of chronic social disease, and many people don’t even have an idea how it feels to be free and uncompromised.